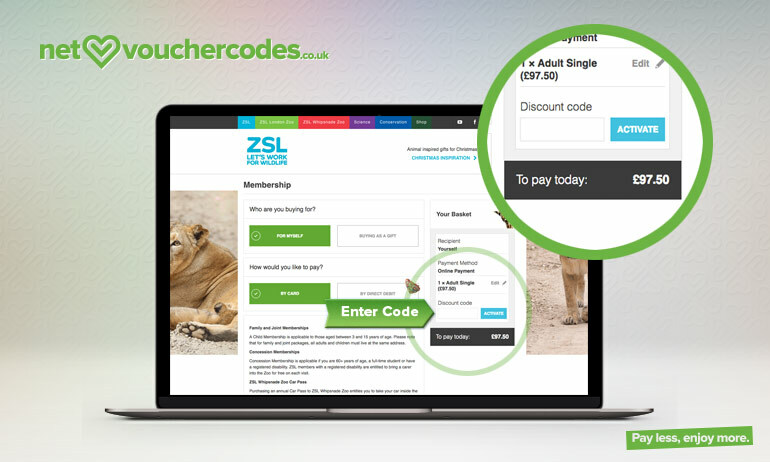 Where do I use my London Zoo voucher code? Follow our link to the London Zoo website and click ‘Buy Tickets’. Choose your ticket type, quantity and date, then click ‘Confirm’. Paste your promo code in the box beneath your order and click ‘Activate’. Click ‘Checkout Now’ to complete your purchase. London Zoo is part of The Zoological Society of London, founded in 1826 by Sir Stamford Raffles as a scientific conservation and educational charity dedicated to promoting the worldwide conservation of animals and their habitats. Visit the London Zoo today and discover all kinds of animals including lions, spiders, lemurs, gorillas, penguins, butterfly’s, creatures of the rainforest, tigers and much more. You can enjoy walkthroughs, daily animal activities such as demonstrations, talks and shows, and can even have a go at feeding some of the animals yourself! Whether you’re heading to the zoo as a family, as a group, with a school or are looking to hire the area for an event, you can enjoy 10% discount on all ticket prices when you book online. Before you book your visit check out the ‘What’s on’ page to find the dates of exciting events, you can also find important information about the zoo including its opening times, parking options and news, so you know exactly what to expect on your visit. 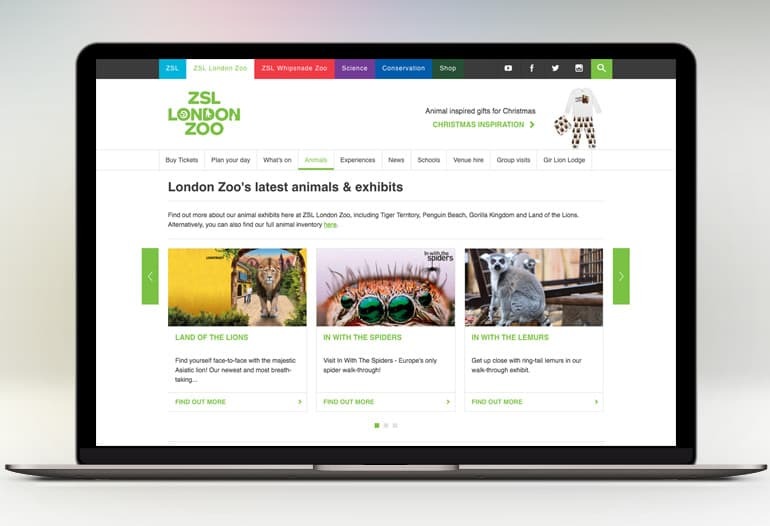 Browse the experiences tab on the London Zoo website and discover plenty of intriguing things you and your kids can experience during your visit. These include being a keeper for the day, meeting the animals up close, photography workshops, bedbug sleepovers, the friendly spider programme and a trip to the Gir Lion Lodge. Find everything you need to know about school visits, group visits and venue hire, as well as a complete price list with 10% discount online. You can also find tons of information, tips and advice on the ZSL London Zoo blog page. Located within roaring distance of the Asiatic lions, guests can experience ZSL London Zoo in a whole new light and discover what happens when visitors go home in the Gir Lion Lodge. The Gir Lion Lodge is hidden away within the Land of the Lions development. Stay the night in beautifully decorated lodges, inspired by the welcoming charm of the lion’s native home in Gir Forest, India. During your luxury stay in the Gir Lion Lodge you can enjoy exclusive after-hours tours of the zoo at sunset, after-dark and in the morning, as well as amazing animal feeds, two days access to the zoo, with the option to explore ZSL Whipsnade Zoo on your second day, a delicious two-course dinner, a full English breakfast, a complimentary drink on arrival and free car parking at ZSL London Zoo. If you’re looking to visit the London Zoo, book online to save 10% on all ticket prices. You can also take advantage of family and group discounts, and jump the queue by upgrading to Fast-Track entry. For a limited time, you can also enjoy an online discount of 10% without having to commit to a specific date with the "Weather Buster Flexi Ticket". Book your open-ended ticket now and visit any date before March 29th. If you’re a real fan of the zoo you can benefit from unlimited annual visits to ZSL London and Whipsnade Zoos plus a whole host of other incentives with a zoo membership from only £63. So what are you waiting for?! Book your tickets today and enjoy an animal experience like no other, you can even go the extra mile and stay a night at Gir Lion Lodge; tickets starting at just £378 for the whole family. There are over 20,000 animals at ZSL London Zoo alone, all of which are endangered or rescued; placed in the zoo for protection and conservation. With 63 species of mammals, 99 species of birds, 52 species of reptiles, 25 species of amphibians, 226 different species of fish and 233 species of invertebrates, there’s more than plenty to see during your visit to the zoo. London Zoo provides plenty of educational talks, information and intimate experiences with many of the animals, allowing you and your children to understand the importance of each of their survival and to encourage care and support of the zoo and all the wonderful creatures inside it. Adopt an animal, get involved with the many opportunities including the marine conservation and OneLess campaign and even apply for a ZSL Fellowship to help shape the future of our natural world. 10% off your ticket prices when you book online. If you have a complaint please get in touch with London Zoo immediately. The sooner you can get in touch, the sooner they’ll be able to help you. Most complaints can be resolved quickly by speaking to a member of staff. To contact staff and make a complaint please us the customer service information. The legendary ZSL London Zoo is an absolute must for a day out with the family. Immerse yourself in the exhibits, walkthroughs, shows and demonstrations that bring you the world’s most enchanting creatures all in one place. 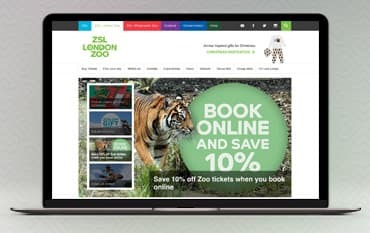 Book your tickets online with one of our London Zoo discount codes and save money on your day out, whether you’re going as a pair, as a family or in a group. If you’re looking for a fun venue for an event, or you need somewhere interesting for a school trip, ZSL London Zoo is the perfect place.